PLOT: Andy (Rogen) is an inventor trying to sell a new product on a cross-country trip. A quick stop to his mom's (Streisand) house leads her to going along for the ride. WHO'S IT FOR? Moms should eat this up if they enjoy Streisand. The thirty-something crowd should be able to relate to Rogen's tiny jabs and annoyances with his mom. What, you don't want to see this movie? Why would you say that? All they are trying to do is entertain you, and you won't even give them a chance? Would it kill you to take your mother to this movie? After all she's done for you? If I was forced to watch one new release with my mother, it would be The Guilt Trip. That's probably a quote that won't be making it on the film's posters, but it's still a pretty decent complement. This film doesn't reinvent the wheel, mother/son relationship, or road trips, but it rarely talks down to its audience. It's also pretty amusing. Andy has sunk all his money into an environmentally safe household cleaner that he created. Unfortunately, he's a scientist more than a salesman. 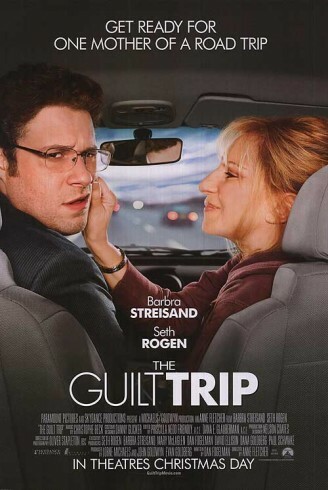 That's the plot that keeps this movie running, but it's the dynamic between Streisand and Rogen that you're paying to see. Andy stops home before his road trip, learns some new, heartfelt information about his mom's past, and feels compelled to bring her along. The Guilt Trip gets the proper level of humor, annoyance and truth out of the mother/son relationship. She doesn't drive him totally nuts, just right to the edge. He jabs, she ignores. A few tiny examples are that Andy makes fun of her frog collection, and a tissue that may be used for three days before being thrown out. It's the little things. Streisand doesn't make her performance a joke as Joyce. I'd say it's 85 percent truth, 15 percent hamming it up for the film. Going into it, I was petrified there would be way too much ham. The relationship goes through the typical beats of trying to figure out the right level of communication, trust and friendship. There is something about the thirty-somethings out there who typically roll their eyes at their mother. I know I've fallen into that pattern with my mom. Sure, there are also pandering moments like Joyce trying to win a t-shirt at a steak house, but there aren't too many. Most of you will spend time with your mom around this time of year. Some of you secretly aren't thrilled about that. This film gets you in the right mindset to realize your mom is an individual, and not someone to take for granted. The Guilt Trip is actually pretty good medicine before the holidays.